It finally feels like spring and that means it's grilling time! 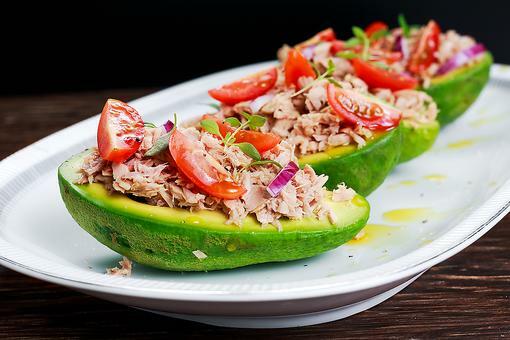 If you’re looking for an easy, healthy side dish for your next barbecue, this is it! This chickpea and corn salad is super fresh and light with a beautiful rainbow of colors to brighten up any meal. Want to add an extra special touch? Toss in some feta, goat cheese or avocado just before serving. Wrap corn in aluminum foil. Place on the grill on medium-high heat. Cook for 15-20 minutes, turning every 5 minutes. Unwrap and cool. 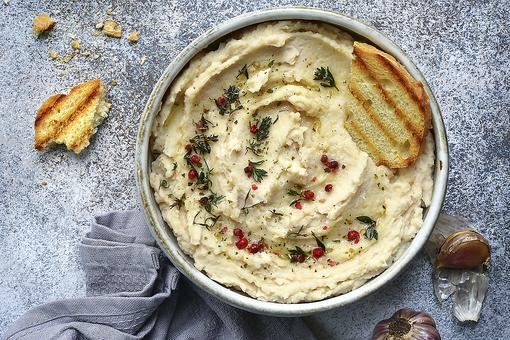 In a bowl, combine chickpeas, peppers, cucumbers, onions, corn, chives and parsley. In a separate bowl, juice and zest the lime. Add the vinegar and whisk in the oil. Add salt and pepper to taste. Add half of the dressing to the salad and mix. Cover and refrigerate overnight (or at least 1 hour). Mix well. Add additional dressing, salt and pepper as needed. White Bean Salad Is Quick, Healthy, Delicious & Packed With Protein! 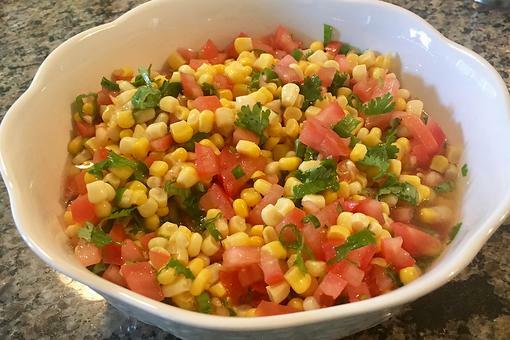 Easy Corn Salsa: This Recipe Is a Healthy After-School Snack! 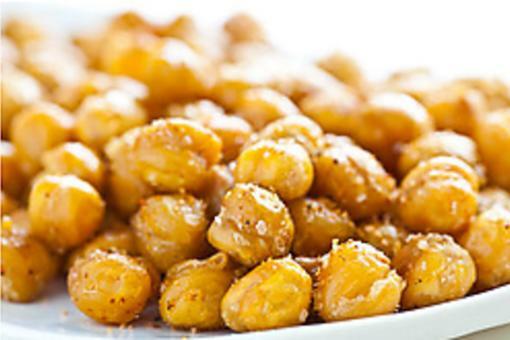 Healthy Snacks: How to Make Easy Roasted Garbanzo Beans! This sounds (and looks!) delicious! Thanks for sharing it with us, Amy! And welcome to our community of writers. We are so glad to have you. Thanks Elisa All Schmitz 30Seconds! Potato Salad Recipes: How to Make Grilled Potato Salad With Lemon Vinaigrette! How to Make Quick Indian-style Rotisserie Chicken Salad! 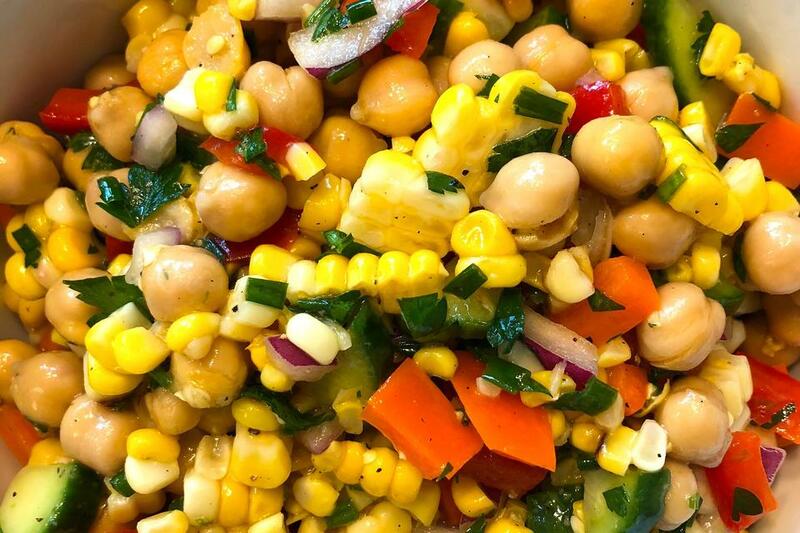 ​This Chickpea & Grilled Corn Rainbow Salad Tastes As Good As It Looks!